The new Mercedes-Benz Van – the commercial van that launched many imitators – will help your business always be ready for the road ahead. The new Mercedes-Benz Van—the commercial van that launched many imitators—will help you sprint ahead of your competition. Commercial shoppers who want a top-quality van have long known that a Mercedes-Benz Sprinter or Metris model from Mercedes-Benz of Draper offers value as well as practical transportation dimensions. The recently announced 2019 Mercedes-Benz Sprinter will bring even more features and capability to the commercial van segment. We don’t yet have a set arrival date for the 2019 Mercedes-Benz Sprinter. Since it’s been available in Europe since June 2018, we estimate that it would be released in the United States either towards the end of 2018 or early in 2019. Please fill out the form below or contact us to get personalized updates on this model in our area. We can’t guarantee you will see all of these advantages when the 2019 Mercedes-Benz Sprinter arrives in Draper, Utah, but there are several new enhancements that we are cautiously excited about on this commercial van. This model will be lighter and more spacious, which would result in maximum payload improvements. Approach and departure angles should also see beneficial changes that will help with driving on irregular roads and work sites. The new U.S. Mercedes-Benz Sprinter may also offer a lower floor and wider doors to simplify loading. We’ve learned that the 2019 Sprinter will be the second Mercedes-Benz model in the U.S. that will have MBUX (Mercedes-Benz User Experience), the brand’s new infotainment system that functions like the Google Assistant or Amazon Alexa, with just a simple “Hey, Mercedes” prompt or via touch or steering-wheel controls. The 2019 Sprinter will also be the first Sprinter to have a 7.0- or a 10.3-inch touchscreen that’s set up with a fairly typical smartphone-type architecture. American drivers like having easy access to their beverages while driving. Mercedes-Benz listened and now the front cabin can be configured with up to ten cupholders, five for each side, including two that can hold jumbo fountain-drink cups! Additionally, those that depend on being plugged in constantly will find an added option for an integrated Wi-Fi hotspot and plenty of connection points. Wireless charging is optional, and a mix of USB-C, 12-volt, and 115-volt AC outlets are available. Those who use standard USB ports will need adapters, but the system is Apple CarPlay and Android Auto compatible. If you’d like to be alerted about the availability of the new 2019 Mercedes-Benz Sprinter in Draper, Utah fill out the form below. 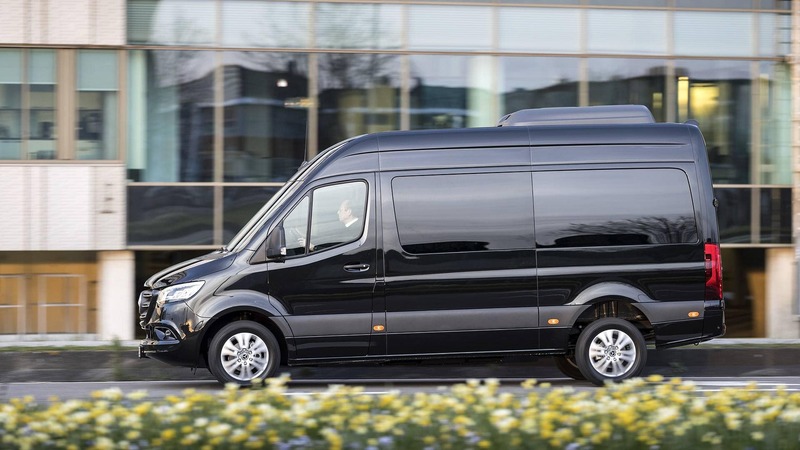 A member of the Mercedes-Benz of Draper Sprinter team will contact you with details of the new Mercedes-Benz Sprinter!